To rescue and provide care and shelter for stray, abandoned, neglected and unwanted animals of all kinds. To protect animals from ill usage, cruelty and suffering. The relief of persons unable to afford veterinary fees for the spaying of cats and dogs by assisting with the charges. The relief of the elderly who are unable to afford kennel costs or vets bills for their pets. Hollytrees kennels is owned and run by Ray and Ann Dedicoat who have been involved with the care and welfare of animals throughout the West Midlands for over thirty five years. Hollytrees Animal Rescue Trust is based at these kennels. Hollytrees is one of the busiest rescue centres in the area. Covering the practical aspects of animal welfare including catching, spaying/neutering, re-homing, rehabilitating and educating. We also run an emergency pet care scheme, working alongside the emergency services and other animal welfare organisations 24 hours a day, seven days a week. There is emergency accommodation to cater for most animals or birds. Ray Dedicoat's personal involvement in animal welfare stretches for over 35 years. Starting with voluntary work for Mr and Mrs Elliot who first opened Hollytrees in 1952, here they ran the Midlands Rescue Kennels For The British Union for the Abolition of Vivisection. Everyone involved was voluntary and were mainly concerned with rescuing animals that were destined for laboratories. This was a time when pets and strays were rounded up or stolen to order for use in research, especially in the cosmetic industry. Ray Dedicoat runs Hollytrees from the very same kennels. Mr and Mrs Elliot bequeathed Ray half of their estate because they trusted him to carry on the work which they had dedicated their lives to. Honoured by this gesture Ray has put his heart and soul into Hollytrees, which is clearly visible when you come to visit. Ray has massively increased the number of animals Hollytrees can help, a fantastic memorial to the Elliot's work. Hollytrees became an independent charity on the 30th of June 1997. For the previous 13 years Hollytrees had a mutually beneficial and supportive relationship with The Animal Welfare Trust. A tremendous amount of good work was done during this time. The decision to become an independent charity was taken to ensure that all monies raised for animal welfare in the West Midlands, went directly to helping animals in the West Midlands. Apart from two funded kennel assistants, the rescue centre is run on a completely voluntary basis. This means the animals are the benefactors of your donations, which are all gratefully received. We are extremely proud of the services and facilities that Hollytrees provides. There was a time when we enjoyed letting you look around the rescue centre, seeing all the work we do. Unfortunately in these modern times viewing is strictly by appointment only. 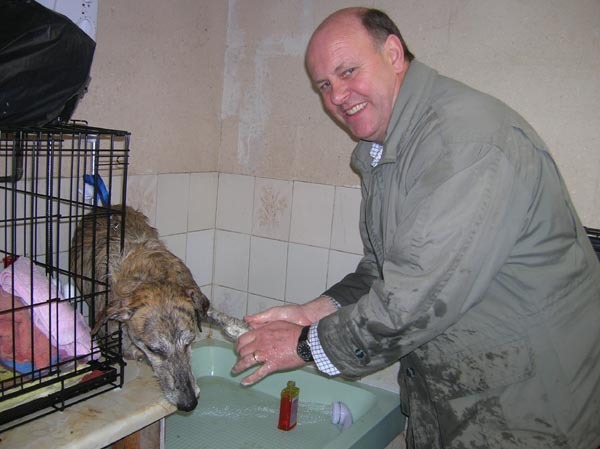 To read about Ray's award from the International Fund for Animal Welfare, please click here.